24 Months - $19.99 Only 3 left! Toddler (3T-4T) - $19.99 Only 1 left! Because there's no reason to feel blue when you're a blue crayon! If your child is feeling *blue* about his costume options this Halloween, then we've got a certain something that we're sure he's gonna love. A crayon costume! All of our crayon costumes are soft--like so soft could you could almost take a nap in them! They're also very durable, just a like a real crayon. And of course they're also officially licensed, because being an authentic Crayola crayon is kind of a big deal! 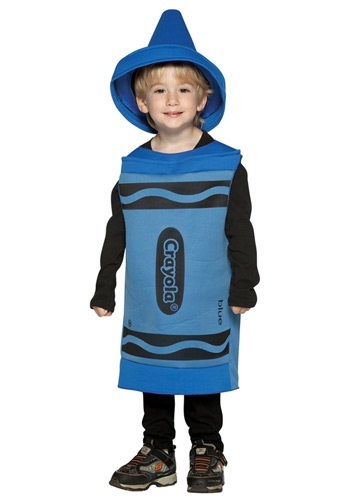 You can pick out this Blue Crayola costume for any boy or girl and it will look just like one of the crayons from their favorite box. Did we mention that you can find a bunch of other colors right here too? The best part about these unique costumes is that you can assemble all of the colors together for a great group theme. Invite all of his or her friends and have a good old fashioned crayon box party this Halloween. Sounds like a great time to us!